It was seven years ago that we first heard tell of an Elton John biopic, and slightly less than that since Tom Hardy, of all people, was confirmed for the lead role in what would be called Rocketman. Alas, time and Venom, probably, muddied up those plans, and Kingsman star Taron Egerton has since stepped into the role of the glam-rock legend. Today, thanks to The Hollywood Reporter, we now have our first glimpse of the star decked out in John’s traditionally gaudy fashion. Dexter Fletcher, who recently stepped in to replace Bryan Singer on the soon-to-be-released Queen dive Bohemian Rhapsody, will continue to prove his biopic bonafides with this feature, which was previously described as a “musical fantasy” and now dubbed “an unvarnished rock ‘n’ biopic, with John’s life stripped back of the glitter.” Egerton’s look here lies somewhere in between those two poles, with his sparkly glasses, gold lamé jacket, and Hermes-aping sneakers set against the sterile environment of what looks to be a private jet. 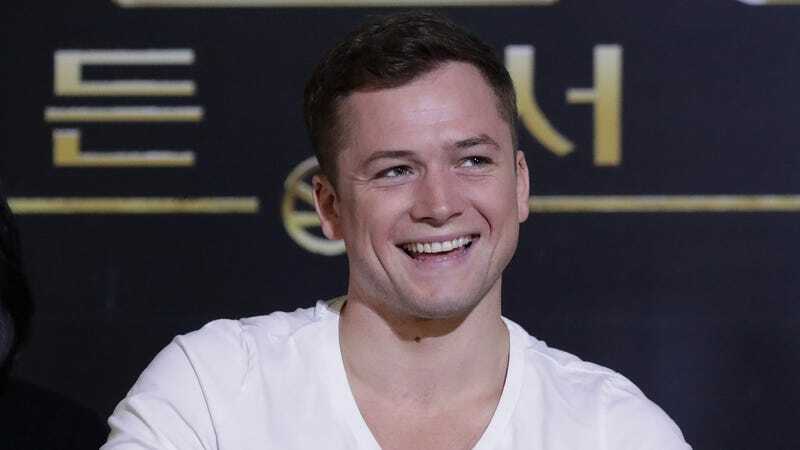 Rocketman will surround Egerton’s John with an impressive cast that includes Jamie Bell, Gemma Jones, Bryce Dallas Howard, and Game of Thrones’ Richard Madden. It saunters into theaters on an ivory grand piano on May 31, 2019.